Spring has sprung in the Northern Hemisphere and green shoots are appearing everywhere, even in seemingly dormant economies. In a matter of weeks, activity across a broad range of industries has picked up and talk of recession has been more muted. On top that, some global anxieties seem to be easing. “Known unknowns” — such as the US-China trade war and Brexit — look like being shifted into the “known knowns” basket. The big investment bank, JP Morgan’s keenly watched global “all-industry output PMI” increased for the second successive month in March, as did its “new orders index”. The PMIs — or Purchasing Managers’ Indexes (ISMs in the US) — survey businesses on a monthly basis, collating data on such things as new orders, output, exports and employment intentions. A result above 50 represents expansion, the higher the number the greater the activity. A PMI below 50 shows things are going backwards. Right now global PMIs are not only showing expansion, the rate of expansion is accelerating. Not surprisingly global GDP is picking up too. 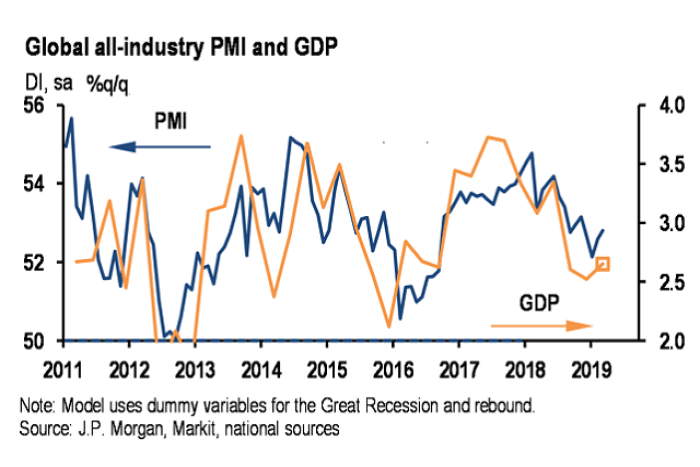 Just as one swallow doesn’t make a summer, two solid months of global PMIs don’t necessarily usher in a growth spurt or ward of a slowdown — but it is at least promising, according to JP Morgan’s economics team. It should be pointed out the global PMI gain has largely been supported by two factors: strong performances by the services sector, rather than manufacturing, and a rebound in activity in China. Australia has so far broadly missed the global PMI bounce. PMIs, while still positive are near six-year lows and forward-looking new orders are getting weaker. The construction sector variant, the PCI, is contracting. Still, there were heartening signs last week in the retail sector, while the monthly trade balance ballooned to almost $5 billion in February on the back of some furious shovelling and pumping in the resources sector. The composition of the global recovery may be somewhat unusual, according to JP Morgan, but it makes sense in the context of China being more aggressive than other countries in stimulating its economy. Leaving aside Europe’s ongoing struggles, UBS resources analyst Glyn Lawcock says PMI and industrial production data from the other big economies such as the US, China and UK point to robust growth and demand for commodities in the months ahead. “The latest demand indicators cite revitalising growth, owing to easing trade tensions, and waiting for the Chinese infrastructure stimulus to take effect through the second half of 2019,” Dr Lawcock said. China’s rebound back to expansion should be particularly heartening for Australia’s commodity exporters. “The latest reading was the first sign of growth in four months reflecting recovering domestic growth amidst easing trade disputes … we expect [economic] growth to pick up sequentially [in the second quarter],” Dr Lawcock noted. However, drilling into the PMI surveys, the more downbeat outcomes were ongoing falls in manufacturing expectations. Those assumptions don’t auger well for global business investment, although a successful conclusion of a US-China trade deal might turn things around on that front. “The relative resilience of the global services PMI in the face of the sharp down-trend in the manufacturing index over the past year has been impressive,” JP Morgan’s David Hensley said. The global manufacturing sector may have stabilised, but it still hasn’t turned the corner going into the second quarter. 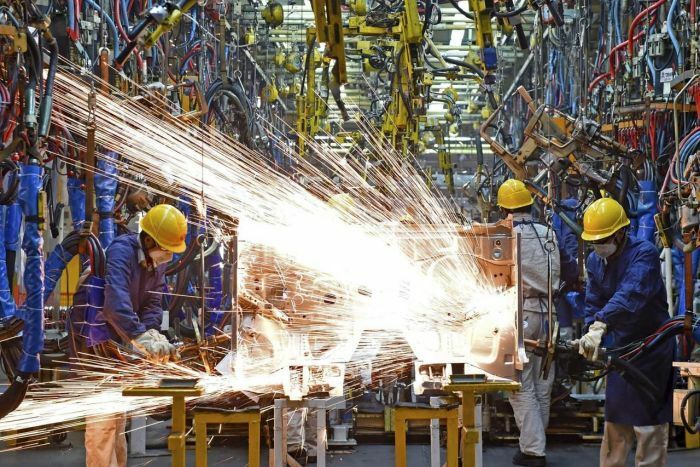 “While the all-industry PMI is moving in a constructive fashion, with both output and orders rising, we would feel more confident about a sustained improvement in both the PMI and economic growth if some rebalancing were to occur between the services and manufacturing sectors,” Mr Hensley said. 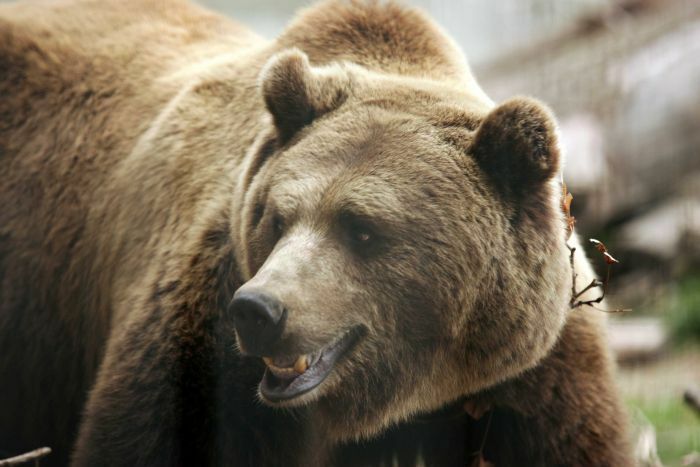 There was more bad news for the bears to end the week, with another ‘goldilocks’ outcome in the US jobs market and increasing optimism US-China trade talks will deliver a workable deal sooner, rather than later. With the effect of the US government shutdown last year washing through, jobs growth accelerated to its fastest pace in almost 18 months. Separate data earlier in the week showed US jobless claims are at their lowest point since 1969, while there are 1.3 million more job vacancies than there are unemployed workers. Bond markets are now betting there is less than a 50 per cent chance of a rate cut from the Federal Reserve this year and the ‘inverted bond yield’ is being treated more as an intellectual curiosity than a harbinger of recession. Wall Street’s benchmark index, the S&P500, rose 0.5 per cent on Friday to be up more than 2 per cent over the week. That was pretty humdrum compared to the 3 per cent gains in Europe and Japan, or 5 per cent on Chinese equity markets. The ASX decoupled in the caboose and went nowhere, although futures markets point to a brisk opening to the week. Newcastle coal, which is a favoured fuel of Asia’s big power generators — not only in China, but Japan (the biggest market) and Korea — has now dropped 40 per cent from its peak of almost $US120 a tonne in August last year. While the Chinese customs’ nebulous go-slow/ rigorous environmental inspection/ import ban has had an impact, it is a far broader problem for Australian exporters. It’s not just a switch to less carbon intensive fuel. Thermal coal’s closest competitor into Asian power generation, LNG, has seen its spot price crash 60 per cent in little more than 6 months. After a busy and largely positive data flow last week, things look a bit more subdued on the domestic data front. One of the more interesting reads will be April’s consumer sentiment from Westpac and the Melbourne Institute (Wednesday). It tumbled around 5 per cent last month. This time around, the survey was taken either side of the federal Budget. Given both parties largely support tax relief for lower and middle income earners, will consumers regain their mojo? As a back of the envelope exercise, the CBA economics team crunched their numbers and found the Federal Government’s tax cuts over the next two years would have roughly the same impact as two 0.25 percentage point rate cuts. Lifting wages by an extra 1 percentage point would be marginally better; all three? Well, the record breaking run of 27 recession-free years will be kicked a fair way down the road. However, if the CBA had to go for one it would recommend tax cuts. “Tax cuts benefit all consumers, not just the one-third with home loans,” the bank noted. However, they do cost the budget. Rate cuts don’t. The March home loan data is further grist for the rate cut debate. The credit tap has been shut to all but the keenest, most cashed-up home buyers. Home loan data is a reasonable forward indicator for the property market. House prices are still falling, but the rate of decline appears to have eased. The March data is expected to show while investor lending remains subdued, owner-occupiers may be back knocking on the banks’ doors. The RBA will deliver a couple of messages about how it sees things are going this week. Deputy governor Guy Debelle will regale his Adelaide audience with a ‘State of the Economy’ speech on Wednesday. On Friday, the RBA drops its semi-annual Financial Stability Review. Bank lending and household indebtedness are likely to be under the microscope. On the corporate front, the Bank of Queensland, drops its first half results (Thursday) and if commentary from the first quarter update is a guide, it could be a fairly bleak affair. Cash profit is forecast to be down more than 10 per cent over the half to around $170 million. Margins are expected to be squeezed, costs may edge up and lending into the Queensland property market is no easy task at the moment.